At the same time as hosting the BC Provincial Senior Triples’ Tournament during the day, WVLBC was home to the Women’s V&D Novice Singles’ in the evenings. North Vancouver LBC had had so many entries for the V&D Novice Singles’ that they needed to use our greens as well. 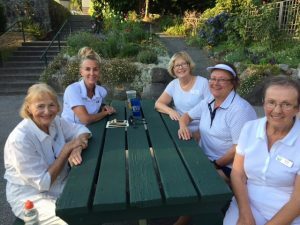 So our men – Gordi, Barry, Bodie and Graham – played at North Vancouver, and our women – Karen, Monica, Julie, Kathy and Alice – competed on home turf. They all played two games Tuesday evening and were divided into A and B Divisions for Wednesday evening with the top four in each division going to North Vancouver for the finals on Thursday night. Sadly, I didn’t get to see the men play on the first two nights, but I can tell you that watching the women bowl, it was difficult to believe it was a novice tournament! They were so good. Monica and Julie were placed in A Division, with Monica ultimately making it to the finals. Barry turned up at North Vancouver on Thursday to watch and was pleasantly surprised to learn that he was playing in B Division. I was able to watch some of his game, which included a spectacular drive that any seasoned bowler would be happy with. Monica was outstanding; she played a woman from Richmond in the final. She had been coached by Radka (herself a Novice Singles’ Champion) all through the tournament and the bowling was amazing. There were so many tight heads that would have made anyone proud. While she led all the way, there was one head where it looked like she might be three down – that is until she drew in for shot. It was unbelievably good! Tons of congratulations to someone who, I have a feeling, has just had her first major win of many. And a hearty congratulations to all who took part, coached and supported our new stars.